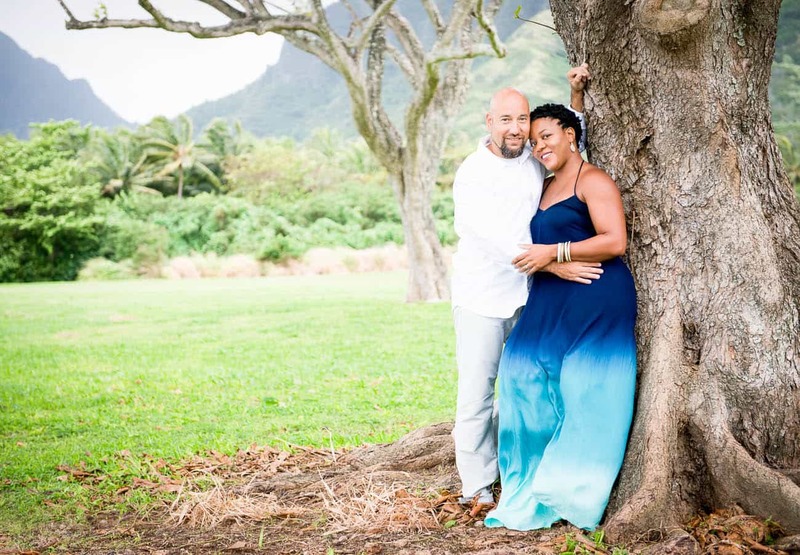 We had a blast with this Kualoa Beach Park Engagement session! Langdon and John have a story almost as beautiful as their love. John is military and deployed in 2010 to the Phillippines where he met Langdon (working for the US Pacific Command.) 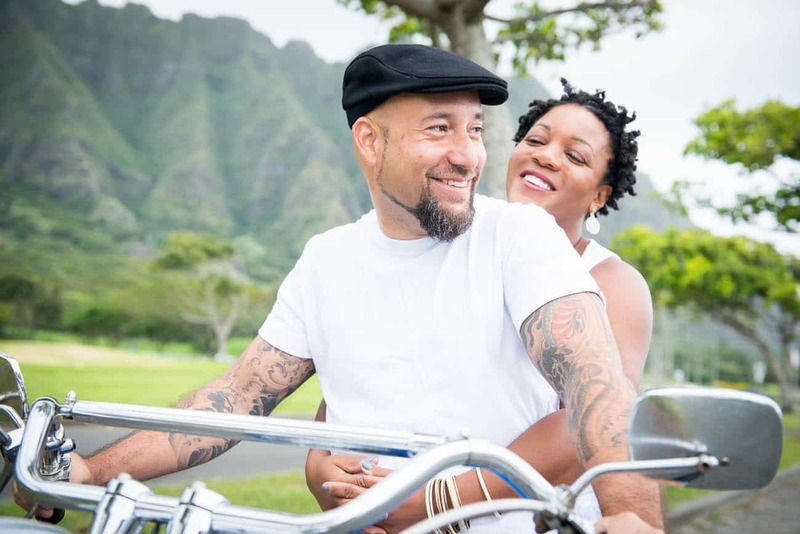 By mid May of 2011, after posts in between, they found themselves both on Oahu. 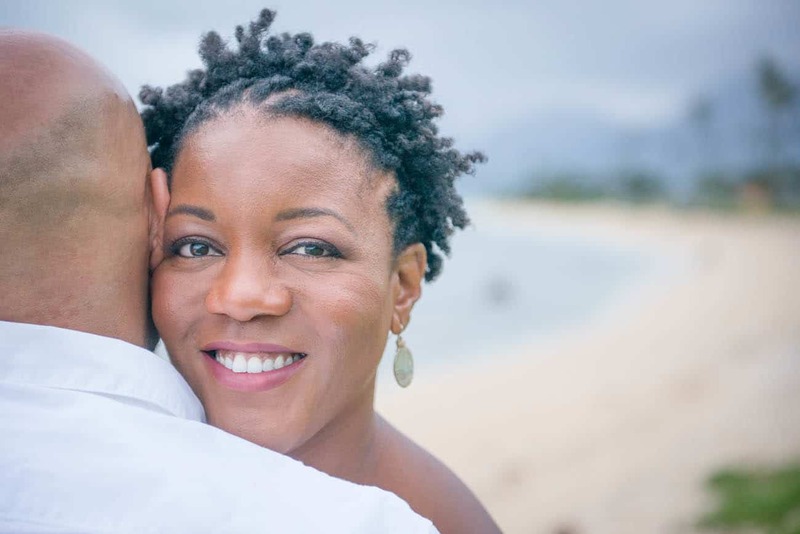 Fate was smiling on them and it only took one weekend for their friendship to develop into love. These are two people that you only need to spend a few minutes with to know that they just fit together. Their compassion, energy, affection, love for life and ability to laugh is not only a gorgeous glue between them, but infectious, making for an amazingly fun shoot! You would never know that it started raining at this point. But J + L were completely optimistic, waiting it out in the car. 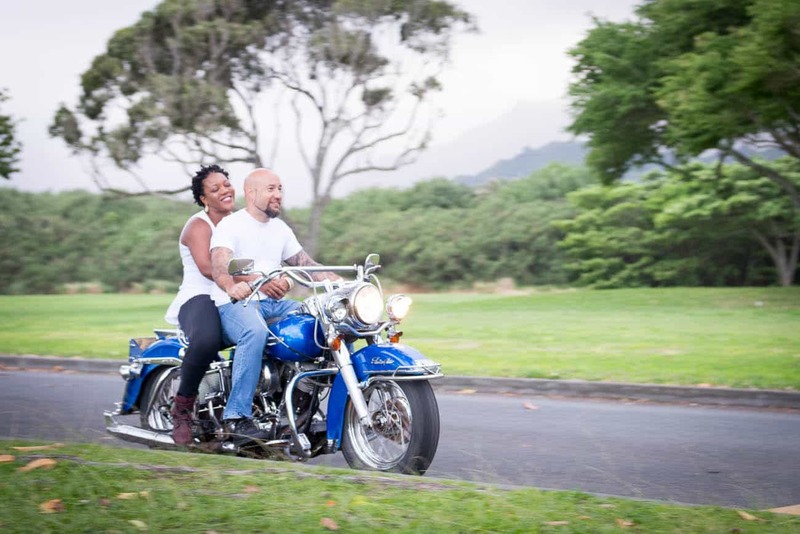 Or maybe it was just a preservation tactic since John rode his vintage Harley to the shoot! 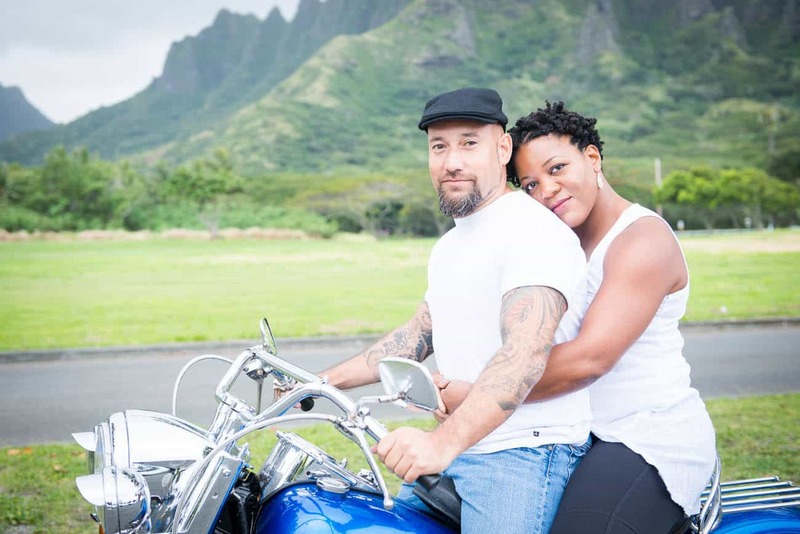 His passion is finding old bikes and restoring their beauty. And while he saw tons of work that needed to be done, I thought it was a gorgeous bike and couldn’t wait to incorporate it! Seriously, I love this couple! 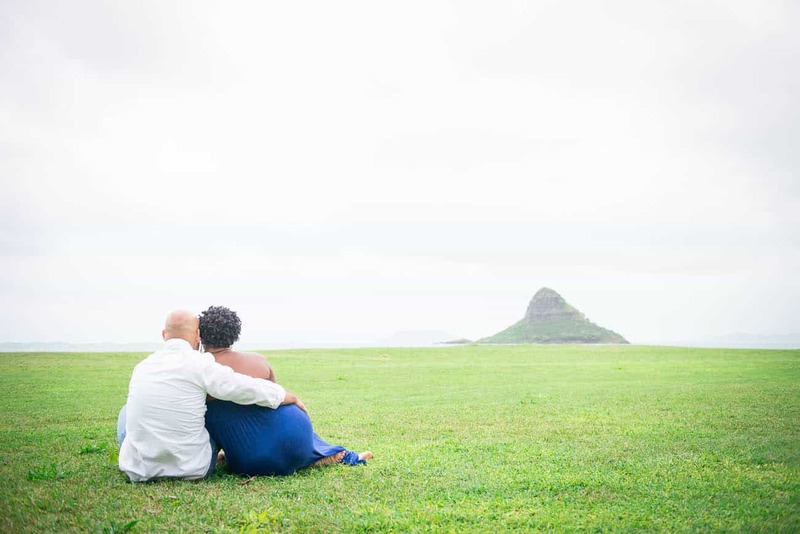 I really didn’t want to give too much direction as it was so enjoyable to watch them interact, whispering to one another, breaking out in laughter, transitioning to quiet moments where conversation was entirely spoken through body language. We couldn’t forget that we were in Hawaii and that most people come to Kualoa Beach Park for the water and amazing view of Chinaman’s Hat. I’m overjoyed to know such amazing people, and can’t wait for their wedding in May! I’m so thankful to be a part of their big day to continue capturing their grace, passion and undeniable connection. People like this make me love my “job” all that much more! 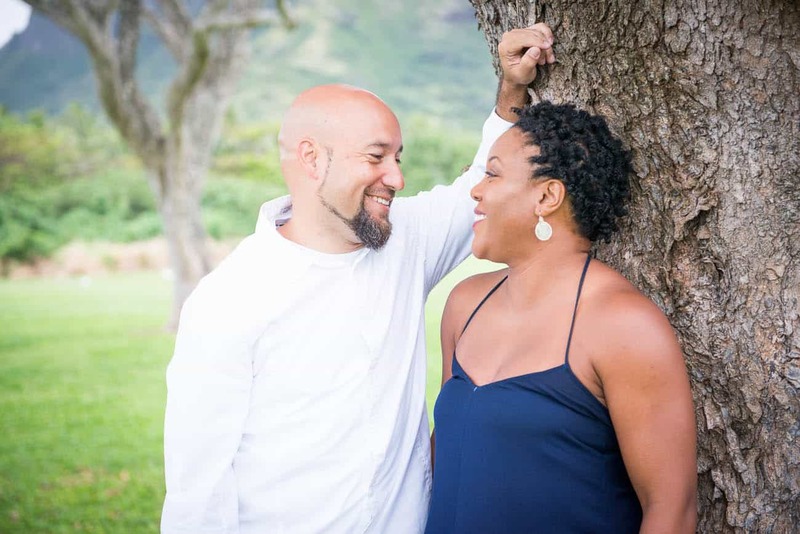 Thinking about a Kualoa Beach Park Engagement session? Let us know!